The latest team to join this exciting adventure with CSGRT is Carbis Bay. In February this year, Sue and Marion led a training day at the office taking a fabulous volunteer team through the various aspects of our pioneering seal research (survey techniques, creation of albums, ID confirmation and data collation). Carbis Bay photo ID hub team: Rose, Andrea, Alison, Denise; coordinated by Shelley. The training was very well received with all participants learning new skills and progressing very quickly. We even had volunteers attending in order to support other existing photo ID hubs (North Cornwall and Pentire)! From ageing and sexing seals to processing the photos and confirming IDs in albums, everyone worked very efficiently and showed impressive team working skills! One of the team was also very brave to volunteer for running the hub catalogue and collating the data digitally for import into our database! This will make the hubs self-sufficient whilst at the same time maintaining a link with the core CSGRT team. During the training day we made a very exciting finding. 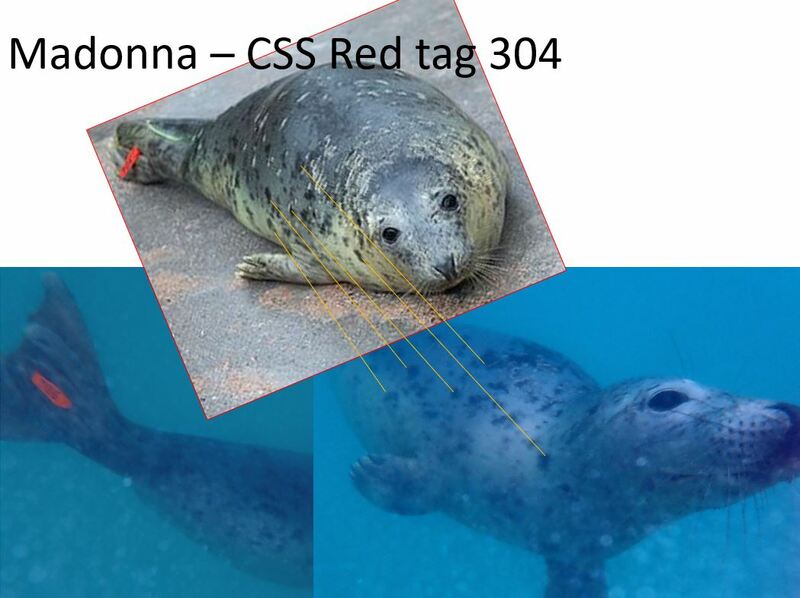 A young seal present in one of Andrea’s set of photos turned out to be a tagged seal from the Cornish Seal Sanctuary! Madonna was rescued in September 2018 at just a week old. After being cared for by the amazing animal team there, she was returned to the wild at the end of December. She wears a red flipper tag, ID number 304. Andrea was very fortunate to meet her during one of her daily swims a month later. This is Madonna’s first identification back in the wild! A great discovery to end a fantastic day!